Introducing Arsenal Inc.s ribbed Krinkov hand guard sets, incorporating an industry-first hardened and polished stainless steel heat shield. Arsenal worked very closely with K-VAR to make these ribbed Krinkov hand guards the leader in quality, workmanship, durability, and with stunning looks. 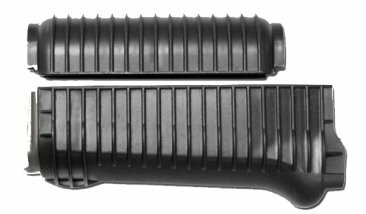 Never before available in the U.S., these hand guard sets feature raised ribs that greatly enhance shooter comfort as well as providing superior heat dissipation over any other hand guard design. These hand guards meet or exceed military standards and feel great in your hand while offering you the ultimate in functionality. The combination of the increased surface area of the raised ribs and hardened stainless steel heat shield offer unmatched cooling performance; a must during rapid fire shooting and an absolute necessity for Class III firearms. They are constructed using advanced polymers, featuring mil-spec metal inserts, to ensure unmatched quality and durability. They are practically indestructible and will not crack, break, or warp and will last as long as your Krink. These hand guards are unique due to the fact that they wrap around the forward part of your receiver to provide additional support even if your receiver is not exactly cut to spec, and would otherwise show a gap between the receiver and hand guard when used with standard non-wrapping hand guards. These hand guards offer a No-Gap solution to your out-of-spec receiver worries. Equipped with crush ribs to ensure a snug fit with all receivers except those that are not in-spec, these hand guards will not come loose, providing your hand guard latch is properly installed. The hand guards are discreetly stamped U.S., with the Arsenal Inc. logo on the inside, and can only be seen with the stainless steel heat shield removed to satisfy the most discriminating collector. They are available in black or plum for stamped receivers or black only for milled receivers.